Back in Roman times, the region that we now call Belgium housed a number of Gallic tribes. Julius Caesar had this to say about the Gallic wars: “Omnii Galii, Belgae, frortissimi sunt” meaning “of all the Gallic tribes, the Belgae are the strongest and bravest”. Belgium’s history is intertwined with her neighbors; the Netherlands, Germany, France and Luxembourg. Located in Western Europe, Belgium also has a border on the North Sea. Belgium was declared independent in 1830 from the Netherlands but strangely, she still remains divided. Today she is called België by the Dutch speaking citizens, (known as the Flemish) who make up 58 percent of the population and reside in the northern half of the country. La Belgique, she is called by the French speaking population, (also known as Walloons) and reside in the southern half of the country. Belgien, is what the German speaking minority call their country, residing on the eastern border. Belgium is a politically divided country, even holding the world record for the longest stint (541 days) without an official government. Evidently the only thing they can all agree on is that french fries, originated in Belgium! Belgium’s capital city, Brussels, known as the “Heart of Europe,” is home to the North American Treaty Organization (NATO) and the European Union (EU). The Royal Palace of Brussels is fifty percent larger than Buckingham Palace. It is said that Belgium has more castles per square kilometer than any other country. The second largest city there is Antwerp, since the sixteenth century known as the diamond capital of the world. Here, ninety percent of raw diamonds in the world are negotiated, cut, polished and distributed. Belgium has the highest tax rate in the EU but they do not have a wealth tax, making it a home to Europe’s wealthiest. They also have an education law that is mandatory for all citizens up to the age of eighteen. Belgium is progressive. She legalized euthanasia in 2002, gay marriage and cannabis possession for consumption in one’s home (for citizens over the age of 18) in 2003. Belgium is known for many things, but the first thing that came to my mind was chocolate. (I have a love affair with chocolate.) It turns out that the Brussels International Airport, is the world’s largest selling locale for chocolate. Belgium produces some 220,000 tons of the sweet goodness, every year. 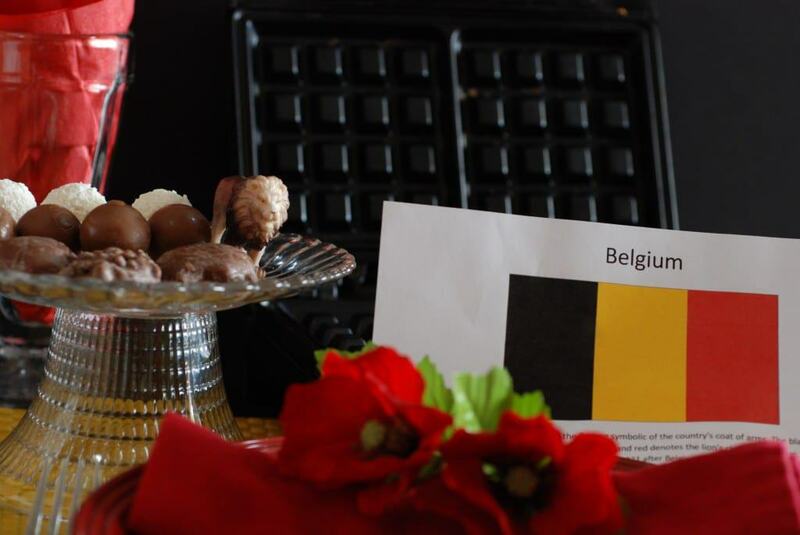 Of course, for many, the word Belgium, begs to be followed by “waffle.” They are famous for their waffles and make two traditional varieties. The variety that we call a Belgian waffle here in the United States, most resembles what Belgium calls the Brussels waffle. (The only difference is they use ale yeast as a leavening agent, instead of baking powder.) The Liege waffle is a rich, denser, sweeter and chewier waffle and native to the greater Wallonia region. Speaking of ale, they make all kinds of beer in Belgium, over 1000 varieties, and they are true connoisseurs. Beer is considered the national drink and Belgians consume on average 150 liters of beer per person per year. Beer pairing is considered an art, requiring specially shaped glasses to bring out the precise flavors and character of a particular beer. When discussing the cuisine of Belgium, it is often said that the food has the quality of the French and the quantity of the Germans. What I love about this journey, are the unexpected things I learn along the way. First off, I had no idea that french fries, really did originate in Belgium. Evidently, US soldiers back in World War I didn’t know exactly where their trenches were always located and they thought they were in France as they heard people speaking French. When they were served these fried potatoes, they simply called them French fries and the rest is history. 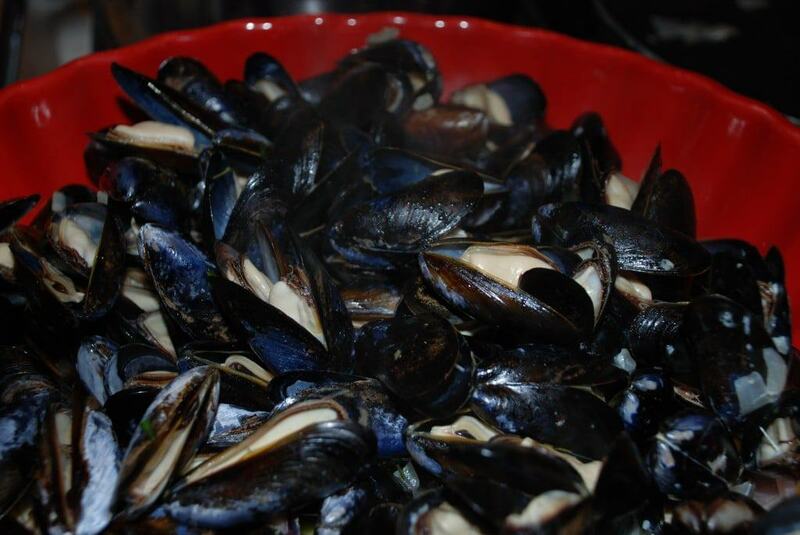 When I learned that moules and frites (mussels and french fries) were considered the national dish, our menu was underway, since I dearly love them both. I wanted to incorporate a vegetable that was specific to the country and found that Brussel sprouts have been grown in Belgium for over 400 years. However, I was also intrigued by the Belgian endive and ended up choosing Belgian endive soup recipe. What I was most excited about though, was the company joining us for this meal. Two very dear friends of ours, Pat and Nancy, who love to eat good food and are inspired by the concept of International Cuisine, are coming to dinner. To be sure, anytime we can share our meal with friends and loved ones, it makes the experience all the more momentous. So pull up a chair and let’s journey to Belgium. The table was set in the bold colors of the Belgian flag (black, gold and red) with red poppies, (the national flower) strewn about. We put on some soothing saxophone music, as the sax was invented by a Belgian man named, Adolphe Sax, and made its world debut in 1841, at the Brussels exhibition. We paired each course with a different variety of Belgian beer served in various shaped glasses. My husband started us off with a toast ‘Op uw gezondheid’ and then ‘A Votre Sante’ which both mean, “cheers.” The first toast was from the Flemish speaking (Dutch) region and the second toast from their French region. The appetizer, called toast cannibal, was phenomenal. 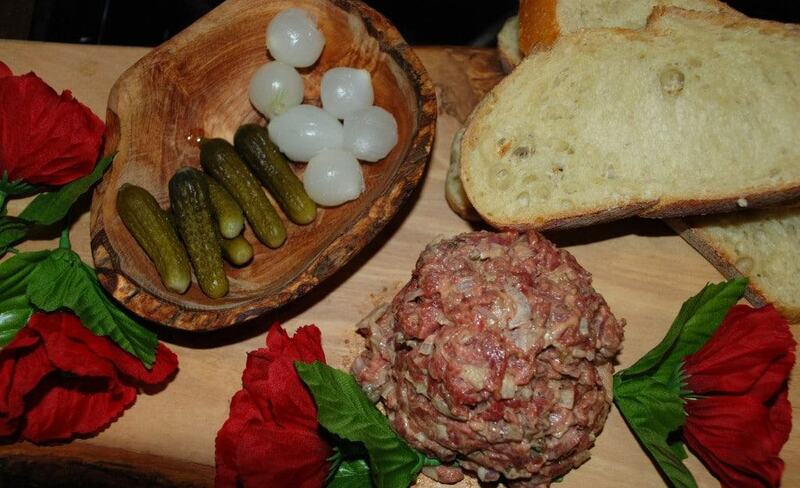 I absolutely love beef capriccio, but had never before made a tartare. This was easy to make and so delicious. The side dishes, cornichons and pickled onions, graced it well. I found a story about the name, “Toast cannibal” to be amusing and so I shared the story with our guests. (See the recipe for the story). 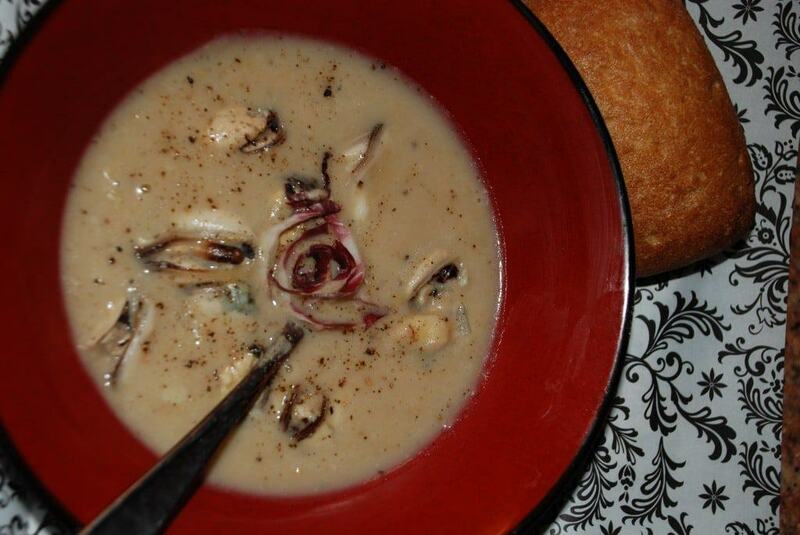 Next we had the creamy and sumptuous endive soup, awesome! The secret to the fries is that they are cooked twice in a grass fed, beef fat, called tallow. The first time you fry is them to soften up the potatoes, like dreamy pillows. The second time you fry them is to crisp up on the outside, for the perfect crunch. They are served in a cone shaped paper cup with mayonnaise. What more is there to say? They are, after all, twice fried french fries. I bought a new deep fryer just for this occasion and ordered the organic, grass fed, tallow online. It turns out the first thing I read in the instructions for the deep fryer was a big warning… “Do NOT use animal fat.” Well, I wasn’t going to let that deter me from properly making the frites. I would, however, like to thank my guests of honor Pat and Nancy for getting me through the frites course. (Pat, your ingenuity in coming up with hair dryer idea to direct the smoke to the vent was brilliant and Nancy, thank you for judiciously holding the hair dryer so that I was free to actually fry the frites.) Needless to say, if you use animal fat in a deep fryer expect that it will create, A LOT OF SMOKE! 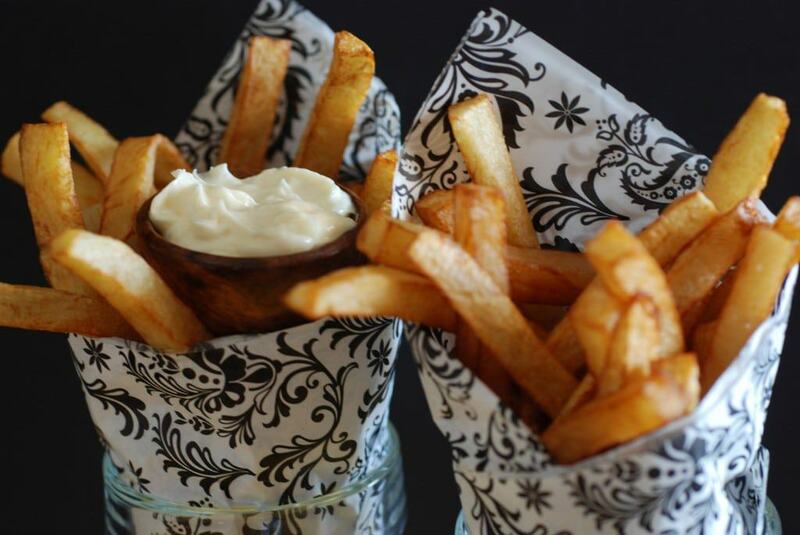 Thanks to our good friends, the frites turned out perfectly! We ate the sumptuously cooked mussels, using the shell as a scoop. This was indeed a simple and delicious pairing; moules and frites. 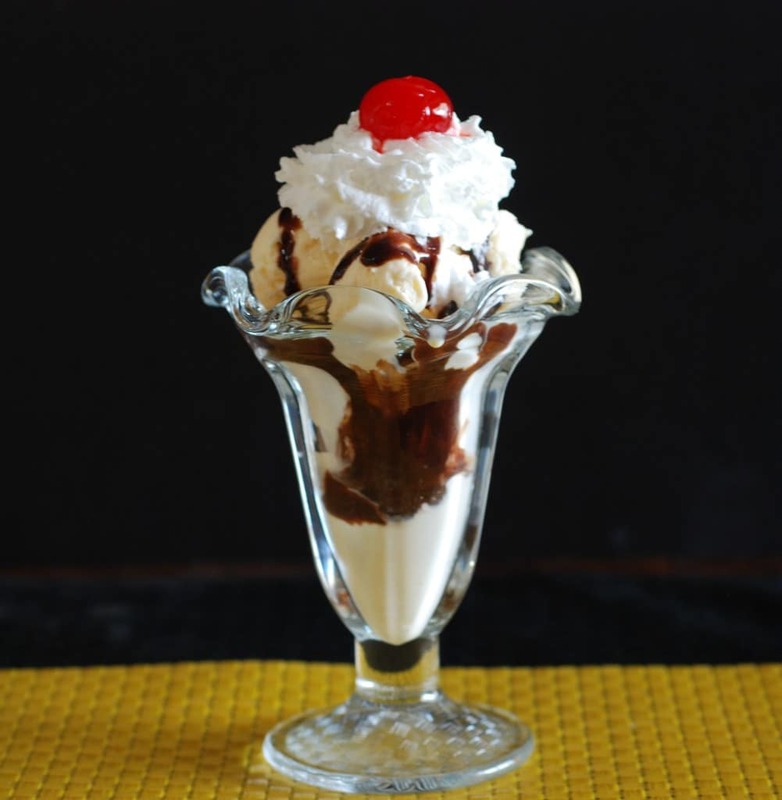 For dessert, we had Hot fudge Ice cream sundaes topped with some fine Belgian chocolate; a perfect way to end any meal. This, to me, was a 5-star meal. I loved everything about it. I will make all of these recipes often and will think fondly of our special guests that saved the frites and joined us in our International Cuisine, Journey to Belgium. Thank you so much for your very kind comments Bonnie, hopefully we can figure out a way to feed the world!